We will help you make the fascinating journey to a professional career with an ​ easy job search for college students. Thousands of part-time jobs, internships, ​student jobs,​​ and assistance with creating your first resume. The current job market is overflowing with diverse ​ high paying jobs for highschool students​​ , internships and other career opportunities. We are here to let you know about each of them. Our ​ job finder for college students​​ is a perfect solution for thousands of students from all over the world. Our mission is to help high school and college students, as well as recent graduates, make the first step towards their dream career. We are committed to finding the best matching internships and​ jobs for busy college students​​ willing to pave their way to success. We collaborate with hundreds of leading employers and offer you a wide range of opportunities to choose from. Our services are not limited to​ job search for students. We understand that offering you a job opening is not enough. 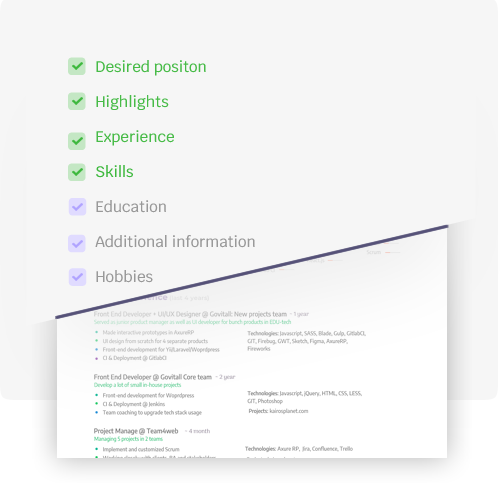 Therefore, we came up with an idea to help you create professional application documents on your own to get hired for the ​ best jobs for college students​​ . Everything you needed before in a single place. The process is very easy. Found a perfect vacancy with​ our​ great job finder for college students​​ ? You are almost there. Taking the first career step may be daunting. 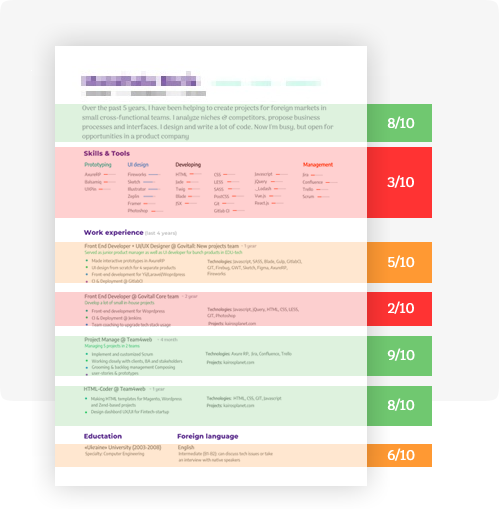 We will help you create a positive impression and excite recruiters with a well-organized and modern-looking resume. 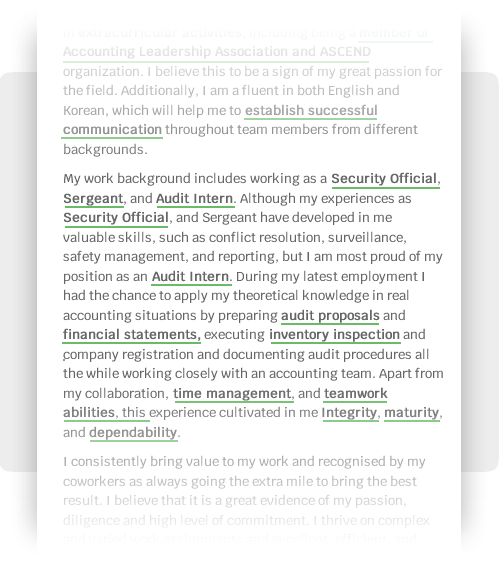 With the help of Artificial Intelligence, you can create a great resume yourself. A single resume may not be sufficient to get ​ job opportunities for students. In case you have no relevant experience, a cover letter can be an excellent solution for you. 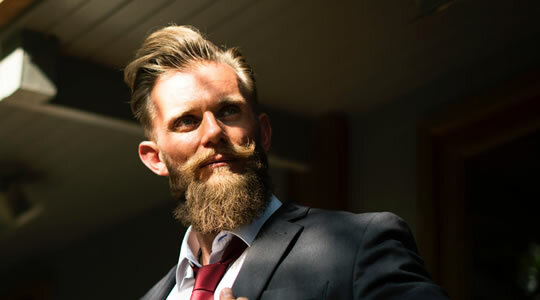 Show recruiters your motivation to work for a specific company and demonstrate your motivation in a sharp cover letter. On our website you can find ​college student jobs ​ for all levels of experience. If you are going to find your first job, use our ​job search for high school students. ​ You will find hundreds of local part-time opportunities. Choose the most convenient ​ job for high school students,​​ apply and start working to earn some extra cash. Want to ​ find jobs online for students​​ with professional experience? For those who have some previous work background, we offer not just our job search engine, but our additional services as well that will help you on your way of getting a dream job. If you are going to find your first job, use our job search for high school students. You will find hundreds of local part-time opportunities. Choose the most convenient job for high school students, apply and start working to earn some extra cash. For those who have some experience, we offer not just to find jobs online for students, but to use our additional services that will help you on your way of getting a dream job. You guys should definitely try out this service. I am a sophomore at college and I desperately needed a job to help my parents with the tuition, so I decided to find some flexible student jobs near me on this website. I was surfing the internet when I saw this website. Must admit how lucky I was. It’s so easy to search for any kind of student jobs you want. I have found hundreds of local part-time jobs I was interested in. Thank you for creating such a cool website for students with no experience. The website is perfect for students looking for a job. I would recommend it to all my friends. I didn’t know how I should enter the workforce after I graduated. On this website I found lots of them, and they were perfectly matching with my skills and knowledge. So I was looking for good paying college student jobs. To my big surprise, I also found a list of internships available relevant to my major. I selected the most convenient ones, and I got a perfect internship in a company I really like. This service can be a great starting point to build a career from scratch. I am a former law student and recently graduated with honors, but still it wasn’t that easy for me to find the job I wanted. This website was a miracle for me. I have searched for real job opportunities for students and found a perfect one for me. I saw that on this website you can get help with your resume. I had little experience, so I didn’t know how to sell myself to prospective employers. With the help of these guys I’ve created a perfect resume and I even managed to get a dream junior job. Btw, I’ve recommended the website to my sister to find part time jobs for students. Explore student, volunter, internsips or part-time jobs in..